In a 60 Minutes interview that aired shortly before Ronald Reagan's inauguration, Morley Safer asked William F. Buckley Jr., "Has there ever been a liberal Buckley? What would you do if one came along and openly proclaimed to be?" Buckley's response: "Pray for him." In so many ways, Buckley was a singularity. 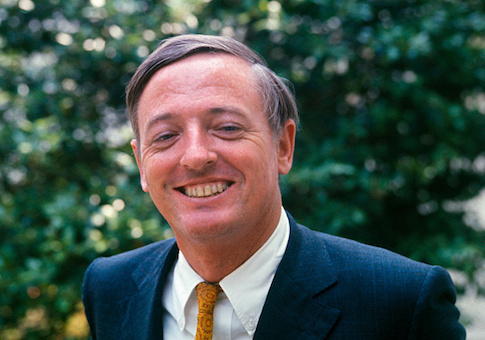 From sailing and playing the harpsichord to his expansive vocabulary, Buckley's uniqueness makes it difficult to discuss his legacy because so much of his influence was a function of his irrepressible spirit, energy, industriousness, and personality. Growing up in Sharon, Connecticut, one of 10 children, he and his siblings put together an in-house family newspaper. He didn't stop writing until the day he died, February 27, 2008. There were 55 books, thousands of columns, a television show that lasted for three decades, and countless personal letters. George Nash once told David Brooks that Buckley might have written more private correspondence than anyone in history. For any other man, that speculation might seem to be exaggerated. For Buckley, it makes sense. When Buckley died, the conservative intellectual movement not only lost its founder. It lost one of its most outsized and appealing characters. Buckley was the paradigmatic opinion journalist: author, editor and publisher, columnist, television host, debater, lecturer. Each media he adopted became a platform to spread right reason. Through his work in print and, perhaps more importantly, television, he communicated that conservatism could be intellectual, respectable, and popular. Buckley's personality and methods quickly became the templates for conservatives everywhere. He was erudite, well mannered, civil (most of the time), and quick-witted, a match for the best the liberals could put up. His journalism, activism, mayoral campaign, social life, and hobbies were parts of a grand drama, a heightened, epic, and entertaining performance. "No other actor on earth," wrote his friend Norman Mailer, "can project simultaneous hints that he is in the act of playing Commodore of the Yacht Club, Joseph Goebbels, Robert Mitchum, Maverick, Savonarola, the nice prep-school kid next door, and the snows of yesteryear." This long-lasting show was delightful and enrapturing. It is no accident that Buckley's best books—Unmaking of a Mayor (1966), Cruising Speed (1971), and Miles Gone By (2004)—feature the same protagonist: himself. Who wouldn't want to live like this wealthy, engaged, connected, impassioned, witty man of letters? To read Buckley's work is to become a participant in his madcap, contentious, and exciting life, and maybe pick up a few of his ideas as well. James Panero of The New Criterion was a recent Dartmouth graduate when Buckley hired him as a research assistant for one of the books Buckley wrote during winters in Gstaad, Switzerland. In a tribute published by National Review Online, Panero described his life with the Buckleys. They worked in the morning as the Goldberg Variations played in the background, then broke for lunch, then skied, before resuming work in the afternoon. "Then, at 7 p.m.," Panero wrote, "Julian, his cook, brought a kir—white wine with a drop of crème de cassis—for each of us. We'd pull out Dutch cigars and discuss the day's progress" before dinner. "He liked to be in bed by 10," said Panero. "We repeated it all the next day." Essential to Buckley's appeal was his sense of humor. We remember the classics: Asked what his first act would be if elected mayor of New York, Buckley replied, "Demand a recount." Asked why Robert Kennedy would not appear on Firing Line, Buckley responded, "Why does baloney resist the grinder?" In 1978, during the question and answer period after a speech at Cornell, a young man asked Buckley whether he had ever gone hungry. "Why, yes," Buckley replied. "My yacht experienced an unfortunate shortage of stuffed goose recently off Nassau in the Bahamas." A few years later, asked what job he'd like to have in the Reagan administration, Buckley said, "Ventriloquist." Buckley's skill at repartee not only stopped the opposition in its tracks. It won him converts. His comedic timing and drollery suggested that no matter how important political debate was—and Buckley thought it hugely important—one can never forget that there are aspects of life that should remain outside of politics. As Buckley wrote: "I like, roughly, in the order described: 1) God, 2) my family 3) my country, 4) J.S. Bach, 5) peanut butter, and 6) good English prose. Should these biases be identified when I write about, say, Satan, divorce, Czechoslovakia, Chopin, marmalade, and New York Times editorials?" The first is personal. I refer not only to Buckley's son, Christopher. I refer also to the countless acts of generosity and charity for which Buckley was famous. Buckley gave more than time to his friends, colleagues, and young people. His protégées run the gamut from Garry Wills and David Brooks to Charles Kesler and Ross Douthat. He also lent his friends financial support when they most needed it. His personal loyalty was ironclad. On occasion, it may have been more trouble than it was worth. Then there is the institutional Buckley legacy. He was integral to the formation not only of National Review and the Human Life Review, but also of ISI, the Collegiate Network, and Young Americans for Freedom, whose manifesto was signed on the grounds of the Buckley family estate in Sharon. Buckley did not just criticize the world, but also sought to change it. Like any good conservative, he understood that institutions live on after their founders have passed. They are how one generation continues to shape the lives of its successors. A third Buckley legacy is political. It was through him and the institutions he created that conservatism moved from the fringes of American life to the center of politics and political debate. He encouraged his friend Barry Goldwater to overcome whatever reluctance the Arizona senator had and run for the presidency in 1964. The publisher of National Review, William Rusher, was instrumental in securing Goldwater the GOP nomination. And of course Buckley influenced another friend, actor and television host Ronald Reagan. Buckley and Reagan met in the spring of 1961. In something of a historical irony, that evening Reagan was Buckley's warm up act. When Reagan introduced himself to Buckley, he said he had just finished Up from Liberalism, published in 1959. He distinguished himself that night—and dismayed Mrs. Reagan—by what he proceeded to do after discovering that the microphone hadn't been turned on. He had tried, raising his voice, to tell a few stories. But the audience was progressively impatient. Waiting in vain for the superintendent to unlock the door to the tight little office at the other end of the hall, in which the control box lay, he sized up the problem and, having surveyed all possible avenues of approach, climbed out the window at stage level and, one story above the busy traffic below, cat-walked, Cary Grant style, 20 or 30 yards to the window of the control room. This he penetrated by breaking the window with a thrust of his elbow; he climbed in, turned on the light, flipped on the microphone, unlocked the office door, and emerged with that competent relaxed smile of his, which we came to know after Grenada, Libya, Reykjavik, and Moscow; proceeding with the introduction of the speaker. And all that was 30 years before bringing peace in our time! The results of that meeting were historic. "The argument goes like this," George F. Will has said. "Without Bill Buckley, no National Review. Without National Review, no Goldwater nomination. Without the Goldwater nomination, no conservative takeover of the Republican Party. Without that, no Reagan. Without Reagan, no victory in the Cold War. Therefore, Bill Buckley won the Cold War." Finally, there is Buckley's ideological legacy. Now, as good conservatives, we are opposed to ideological thinking. What I mean by ideological legacy is that Buckley did more than any other individual to shape and promote the foundational beliefs of postwar American conservatism. He embodied what he called "the philosophy of freedom" and what others called "fusionism": free-market economics, traditional values informed by religious belief, and hardline anti-Communism. It seems clear that Buckley’s ability to hold on to stable and traditional beliefs even while he indulges his instinct for change and variety traces to an unusually strong sense of self, which in turn finds its origin in childhood and family circumstances that were at once reassuringly secure and constantly stimulating. His father was the remarkable Will Buckley, a lawyer and businessman from Texas who made a fortune in oil in Mexico early in the century before getting embroiled in counterrevolutionary activities that finally (in 1921-22) resulted in his expulsion from the country and the confiscation of his property. Those events reinforced tendencies, already well developed, toward unyielding hatred of revolutionary politics and an equally intense devotion to the operations of the free market. The fusion of social conservatism and economic laissez-faire may present an intellectual problem, a potential inconsistency or conflict with which analysts have wrestled for more than half a century. It may also be true, as early neoconservatives pointed out, that the very success of market economics undermines the non-voluntary associations of family, church, community, and nation that are the foundations of social order. Yet in the life and work of Buckley and countless other American conservatives, no such inconsistency, no such problem exists. As Irving Kristol once put it, "For most of American history, the American people were quite comfortable with this dualism and saw nothing odd about it." It was National Review where all these aspects of Buckley's legacy—the personal, the institutional, the political, and the ideological—came alive. The bible of American conservatism was a reflection of Buckley's lively, funny, theatrical, idea-oriented, and learned personality. But it was also the self-conscious institutional arbiter and keeper of the paradigm, the self-appointed guide to the political arm of the American conservative movement. National Review raised the banner of the individual freedom and dignity of human beings against Leviathans at home and abroad. As Buckley put it in his remarks at National Review‘s thirtieth anniversary, "NR taught several generations of conservatives that it is this recognition of a higher order that enables the individual to stand against the massed power of the modern state and say: No, there is more to life than your budget and bureaus, your camps and constraints." Of course, our world is not Buckley's world. When Buckley was at his apogee, the main rival to the United States was the USSR. Today, that rival is Communist China. When Buckley was at his apogee, print and television were the dominant media. Today, conservatives must prove themselves in social media, online, on YouTube and podcasts. For Buckley, freedom was the paramount political value. Today, the centrality of individual freedom to conservatism is being challenged by those who say national sovereignty or communal solidarity is just as important. Buckley made his name when the major political issues were the economy and foreign policy. Today, the major political issues concern identity, citizenship, and culture. The work, though, is ongoing. That is because conservatives, as anti-utopians, do not believe in either final victories or irrevocable defeats. During that 60 Minutes interview a generation ago, Morley Safer asked Buckley if "liberalism [is] finished now" that Reagan was elected. "No," Buckley said. "Neither is original sin." This column is adapted from remarks prepared for the 2019 conference of the National Review Institute.